Over 5,000 years ago, the ancient Chinese discovered a Subtle Energy, they called it Qi, Indians call it Prana, Western people know it as Chi. Every living thing, beings need energy for a movement and physiological activities. Matter and energy are two different manifestations of the same primary energetic substance of which everything in the Universe is composed, including our physical and subtle bodies. Discovery of the subtle energy opened-up a whole new perspective on Health and Healing!!! The Five Elemental Energies and their cycles provide a practical working model through which the interrelationships between the human body and the natural environment may be understood and controlled. They also illuminate the internal functional relationships between the body's various vital organs and explain how external elements such as foods and medical herbs influence the organs and their functions. All aspects of human health, including physiology and pathology, diagnosis and therapy, are rooted in this remarkably reliable system of polar forces and cyclic energy transformations. 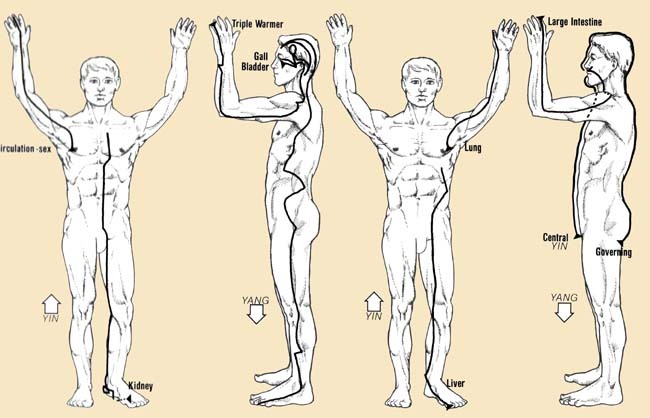 Three are 12 Meridians in the human’s body and they work in pairs. Where one meridian ends, another starts. Two additional Energy pathways, called Central and Governing Vessels. The Meridians are the Energy Pathways that "connect the dots”, hundreds of tiny reservoirs of heat, electromagnetic, and more subtle energies along the surface of the skin. Known in Chinese Medicine as acupuncture points, these energy dots or hot spots can be stimulated with needles (acupuncture﻿) or fingers (accupressure) to release or redistribute energy. The flow of energy in the Meridians is ever changing. The Meridians affect every organ and every physiological system, including the Immune, Nervous, Endocrine, Circulatory, Respiratory, Digestive, Skeletal, Muscular and Lymphatic systems. Each system is fed by at least one Meridian. In the way an artery caries blood, a meridian carries energy. The Meridians bring vitality and balance, remove blockages, adjust metabolism, even determine the speed and form of cellular change. Their flow is critical as the flow of blood, your life and health depend on both. The energy flows in the Meridians up and down throughout the entire body, from head to toe at all times, on a 24 hour continuous set route cycle, with the energy flowing directly from one meridian to the next. Although energy is continuously flowing in all the meridians, it peaks in a specific meridian every 2 hours, and ebbs in that same meridian 12 hours later. During each 24 hour cycle, the energy flow ascends and descends through the body 3 times (through different meridians), feeding fresh energy to all parts, and especially to the organs it serves. Each meridian is paired with another, and flows in a set direction, either up or down and has a starting or ending point on the Hand or Foot. What is Acupressure and How it Works? ﻿Acupressure is an Ancient Healing Art that uses fingers to press key points on the surface of the skin to stimulate the body’s natural self-curative abilities. When these points are pressed, they release muscular tension and promote the circulation of blood and the body’s life force to aid healing. Acupressure points (also called potent points) are placed on the skin that are especially sensitive to bioelectrical impulses in the body and conduct those impulses readily. Stimulating these points with pressure or needles or heat triggers the release of endorphins, which are the neurochemicals that relieve pain. As the result, the flow of Blood and Oxygen is increased to the affected area. The stimulation of one point can send a healing message to other part of the body. Each acupressure point can benefit a variety of complains and symptoms. Acupressure can be effective in helping relieve headaches, eyestrain, sinus problems, neck pain, backaches, arthritis, muscles aches and tension due to stress. This causes the muscles to relax and promotes healing. With Pressure Point Therapy more than 100 common ailments can be massaged away. Ache, allergies, anemia, anxiety, arthritis, back pain, breathing difficulties, circulatory issues, constipation, eating disorders, energy tune-up, fever, headaches, heart disease, high blood pressure, immune system tune-up, insomnia, joint pain, knee pain, menopause, migraines, PMS, shoulders pain/tension, sinus problems, sore throat, stiff neck, stress, edema, tinnitus, toothache, weight control and more. Acupressure complements sports medicine treatments by using points and massage techniques to improve muscle tone, circulation and relieve neuromuscular problems. The Chinese have also used acupressure as beauty treatments for thousands of years. The potent points can be used to improve skin condition, tone and relax the facial muscles, which lessen the appearance of wrinkles. The healing benefits of acupressure involve both the relaxation of body and its positive effects of the mind. As tension is released, you not only feel good physically, but you also feel better emotionally and mentally. When your Body relaxes, your Mind relaxes as well, creating a state of a new Awareness and Consciousness!!! At The Healing Power a session of acupressure is performed on the massage table in a quiet and relaxing environment. It takes about 60 minutes including an assessment; it involves a variety of healing energy modalities. Different therapeutic massage techniques are employed during the session as to provide the best results for the Client, to benefit Client's experience and to improve the quality of Client’s life without drugs or surgery. Although acupressure is not a substitute for medical care, it is often an appropriate complementary aid. For instance, in can speed-up the healing of a broken bone once it has been set, or helps a cancer patient to alleviate some of the associated pain and anxiety of the disease.